Not sure what my advance is at the moment, but I'm pretty sure I haven't changed it since before I put in the accuspark. Back then mine was 10 degrees BTDC and ran at 1000rpm at idle, which it still does - I'd say as long as it isn't shaking the car to bits at idle you should be fine. Thanks Adam! As I was installing it I thought I hope Adam is proud of me!! Any ideas what that internal (earth?) wire is for in the distributor? I wondered if it's even used by the electronic ignition? Also do you know roughly what MPG you currently get? I thought possibly advancing the timing slightly might improve economy. But I'm happy to just leave it if the car is running well. Hi there, first post on this forum. 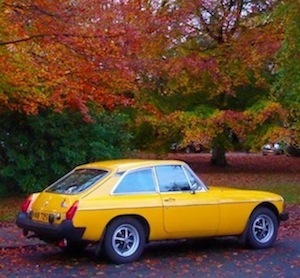 I fitted a complete accuspark bundle to my 79 MGB 2 years ago. This comprised a 45D dizzy, electronic module, rotor arm, HT leads and weird 4 electrode plugs. It was simplicity itself to install and after6000 miles has been faultless. Thanks for replying Gizzypower! My accuspark once set up right has worked great. 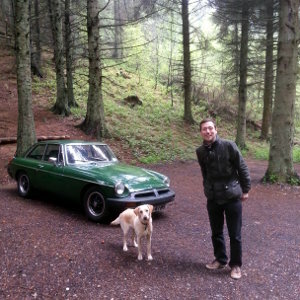 The car starts better and mpg seems good too! Thanks again! Quote "does anyone have any opinion on the best idle timing with the vac advance capped? Reading around on the internet, some say 10 degrees is too slow and others say 20 degrees or 15 etc is too fast....."
I fitted an Accuspark distributor to replace my 40 yr old Lucas one, I thought replacing the whole distributor was best because all the internal parts are then new as well, so no worn out part left to mess up the timing. With ignition off, put the car in 4th gear and rock it slowly forwards so the crank pulley turns clockwise (you can leave the spark plugs in). From underneath the car, find the TDC (Top Dead Centre) mark on the crank pulley wheel, its a notch, then mark it clearly with a white paint touch up pen. Rotate the crank by rocking the car forwards again until the TDC mark now aligns perfectly with the 20 deg mark on the casing, on mine this is the 4th saw tooth mark before TDC (TDC being the last one you get to, and 5, 10, 15 and 20 deg marks before that). When the pulley wheel white TDC mark is aligned with the 20 deg position, then very carefully and accurately mark the pulley wheel (I used a large screwdriver and a hammer) in line with the TDC tooth mark on the casing. So now you will have a 20 deg advance mark for reference on your pulley wheel. To make it clearer, I rotated the crank again and marked this position with a red paint stick this time so I could clearly see it. Now you need to set the timing and you must have a timing light to do this, but good news is that a standard cheap one is fine. So before you start, note the distributor position, then loosen the distributor clamp so that you can just rotate it by hand, but its not too loose to move by itself under engine vibration. Disconnect the vacuum advance pipe (either end). Start the engine (take it out of gear first!). With the timing light connected, rev up the engine quite a bit and you will see the timing marks (white and red) move back and forth. You will see the red mark move back and forth as you rev the engine but it will stop at a certain point no matter how high you rev the engine, so you must rev the engine until the red mark stops advancing. What you are trying to achieve now is to get the new RED 20 deg mark on the Pulley wheel to move forward and stop at 12 deg (between 10 and 15 deg tooth marks) when the engine is revved up. With the red mark maxing out at the 12 deg position, this will correspond to 32 Deg max advance, the perfect position for your engine. If the red mark is not at the 12 deg position then back off to idle, turn the distributor a bit and try again, its easy! Once the 32 deg advance position is achieved and set, then you know the idle position is set correctly for your engine; mine settled at 8 deg at idle but it doesn't matter as the 32 deg max advance is what your aiming to achieve for your engine. Don't forget to tighten up the distributor clamp and reconnect the vacuum advance pipe. Hope that's easy enough to understand. Hi yes mine is still fitted and never misses a beat. I couldn't recommend it enough.